I’m going to be spending some time in France in a few months, so I’ve decided to brush up on my French language skills. Actually, calling them “skills” isn’t quite accurate — unless the meaning of “skills” can be stretched to include a capability that really doesn’t exist. I can read a little French, and I remember that jambon means ham, but that’s really about as far as it goes. I took French in junior high school, in high school, and at OSU until I met my language requirements. Despite these years of patient instruction, I never moved past the most basic levels. Not surprisingly, my French class memories don’t involve having rapid-fire conversations with proud and dazzled teachers. Instead, I remember trying to get some “extra credit” by helping my high school French teacher decorate her classroom for Christmas. To my befuddlement, she wanted me to hang up the letters of the alphabet. After I did so, she asked me if I got the reference. When gave her a confused look in response, she gestured at the letters, barked out a short Gallic laugh, and said “No L!” I shrugged at this weak example of French humor, then remembered that sophisticates in that country considered Jerry Lewis a genius. In college, our pleasant if somewhat beefy French instructor wanted to give the class an example of the importance of precise pronunciation. She explained that, during a recent visit to Paris, she was being pestered by a beret-wearing, cigarette-smoking man. She meant to dismiss him with a gruff cochon, which means pig, but instead she said couchons, which unfortunately suggested a desire to do the horizontal bop. She then barked out a short Gallic laugh as the members of the class snickered at her embarrassing predicament. The only other things I remember from my college French classes are that we students thought mangez mes sous-vetements, which means “eat my shorts,” was a hilarious insult even though the exasperated teacher pointed out that the French never use that phrase, and we also put n’est ce pas? at the end of every conceivable statement because it at least ended our halting sentences with a smooth closing. So, trying to get up to speed on French in a few months is probably futile — especially since studies indicate that trying to acquire new language skills becomes more difficult with age. I’m going to try anyway. I’ve reserved some French language instruction CDs from the library and am going to listen to them on our morning walks. 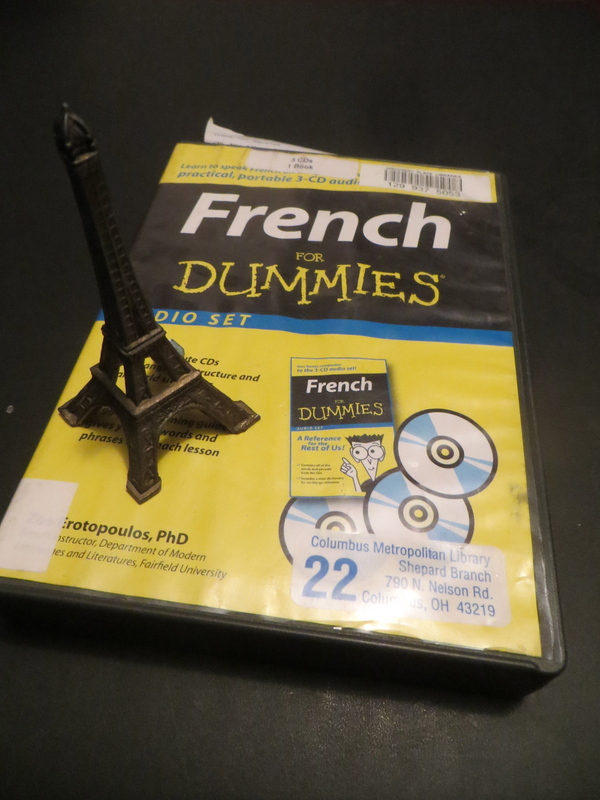 I’m starting with French for Dummies. The title is a bit insulting — but it’s probably accurate, n’est ce pas? There’s a bizarre controversy underway in France. Agence France Presse initially published an unflattering photo of Francoise Hollande, France’s President, then withdrew it — and people are wondering why. The photo — which appears in the article linked above — was taken during Hollande’s visit to a school. In the picture, Hollande has a bug-eyed look and a goofy grin and is sitting in front of a blackboard that says “today, it’s back to school” in French. Some people aptly described the photo as making Hollande look like “the village idiot.” Then AFP withdrew the photo, and the questions began. Did Hollande’s office lobby the agency to remove the photo, and if so, did AFP buckle to presidential pressures? Still later, AFP issued a statement that said that its decision to withdraw the photo was an error, but added that its policy is “not to transmit images that gratuitously ridicule people” — such as a photo of a public figure picking his nose. The picture of Hollande is unflattering, to be sure — but it’s also hilarious. I could understand a politician with a huge ego not wanting the picture to be published. I happen to think, however, that it doesn’t hurt to remind politicians that they aren’t god-like creatures. Capturing our leaders in human poses — silly expressions and all — helps to remind us all that they are, after all, just people, with the frailties and shortcomings of other members of the human race. Democratic societies aren’t, and shouldn’t be, places where press agencies are worrying about whether a picture portrays a leader in a sufficiently heroic light. So, let the bug-eyed village idiot picture stand. If Hollande is smart, he’s use it for a little self-deprecating humor. If’s he too arrogant to do so . . . well, the picture will come in handy. 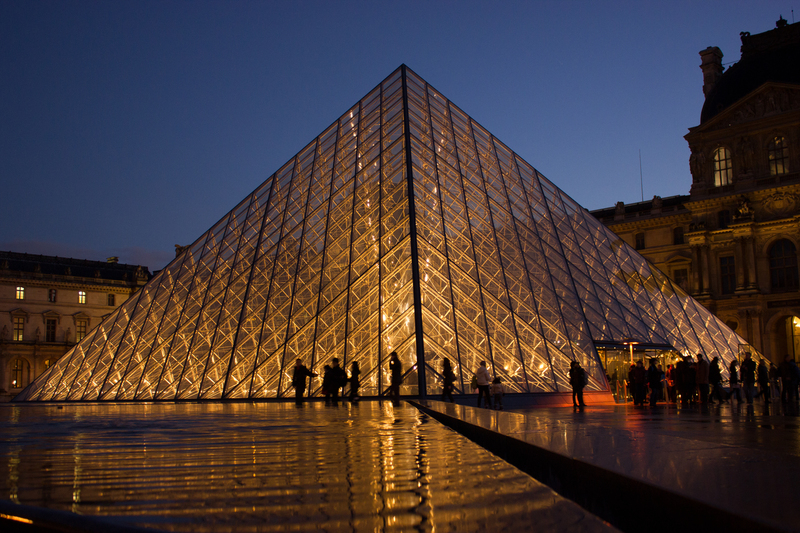 If you’ve ever been to the Louvre, you know one of the great joys of the experience is waiting by the ugly glass pyramid to get in to one of the world’s great museums. And waiting . . . and waiting . . . and waiting . . . . Apparently things have gotten a bit more . . . exciting at the Louvre since Richard and I spent an eternity there one morning two years ago. At that time, it was just a boring exercise in passing the time until we moved to the front of the line. Now the news media is reporting that gangs of aggressive pickpockets that include children are prowling the premises of the pyramid, attacking tourists and employees alike. The crime has gotten so bad that the employees went on strike today and the Louvre was closed to visitors. Can you imagine how you would feel if, on your once-in-a-lifetime visit to Paris, you budgeted one day to visit the Louvre and today was that day? There must be something to this story that I don’t understand. It seems like the response to a pickpocket problem at a particular location, like the Louvre, would be obvious — station a bunch of gendarmes there and have them chase down, tackle, and arrest any perpetrators. You’d certainly think that France would want anyone visiting one of the crown jewels of Paris to be able to do so without grappling with the French equivalent of Fagin and the Artful Dodger. I thought waiting in the Louvre’s endless line that moved at a tortoise-like pace was awful. I guess I should be grateful that I wasn’t mugged to boot. France has seen the latest outbreak of the politician’s double standard. It’s a story as old as politics itself. It goes like this: the politicians decide that, for the good of the country, it’s important to enact some new, typically painful law or regulation of private behavior. The politicians also decide, of course, that it’s equally important that they not be bothered with compliance. This week Jerome Cahuzac, the former French minister who was responsible for prosecuting tax evasion, finally admitted he had a secret bank account in Switzerland and had been lying about it. His admission came two weeks after he resigned following reports that he was funneling funds to the account to avoid the harsh taxes the French government has levied and after Cahuzac had strenuously denied having the account. Now he says he is “devastated by remorse” and begs forgiveness. “Devastated by remorse?” Or, embarrassed that he was caught in a colossal lie and thought he could get away with avoiding the law that applied to everyone else? In America, we see this kind of behavior from our political classes all the time. Congress passes laws that regulate the activities in every workplace except congressional offices. Politicians lecture us about global warming and not relying on fossil fuels then fly on gas-guzzling chartered jets rather than rub elbows with the great unwashed on standard commercial flights. Presidents and Vice Presidents tell us we need to tighten our belts, but enjoy lavish and repeated vacations on the taxpayers’ dime. What’s sauce for the goose should be sauce for the gander — period. On Independence Day, shouldn’t we also remember the conflict that some have called America’s second War of Independence? What’s that, you say? A second War of Independence? I’m speaking, of course, of what Americans call the War of 1812 — when they talk about it at all, which isn’t often. Most people heard about the war in American History class, thought it was boring and confusing, and promptly forgot about it. That reaction isn’t surprising. Who wants to think about a war where Washington, D.C. was embarrassingly captured and burned? The War of 1812 grew out of America’s status as a pawn in the global chess game between Great Britain and Napoleonic France. Both countries tried to restrict trade with the United States, a bit player in the Euro-centric world of the early 1800s, and the British routinely “impressed” — i.e., kidnapped — American sailors the Royal Navy encountered on the high seas. A fed-up Congress declared war on Great Britain, land and sea battles were fought, the White House and the U.S. Capitol were burned by British troops, and the British bombardment of Baltimore led to the penning of The Star Spangled Banner. The war ended with the Treaty of Ghent, in which the British agreed to leave the U.S. border with Canada unchanged and promised not to roil up Indian tribes in the American West, and America stopped insisting that the British end impressment. America then achieved its only significant land battle victory in the Battle of New Orleans, which was fought after the treaty had been negotiated. Although most Americans have forgotten the inconclusive conflict, many Ohioans — including the Bus-Riding Conservative — are buffs of the War of 1812. That’s because one of America’s notable victories, in the Battle of Lake Erie, was fought just off Ohio’s northern shores. An American gunboat squadron commanded by Oliver Hazard Perry defeated a British squadron, and Perry wrote the deathless line “We have met the enemy and they are ours.” Today any reveler at Put-in-Bay — and there are likely to be a few — can hoist a cold adult beverage to Commodore Perry and salute the nearby Perry Monument that towers over the lake’s shores. I’m not a wine snob. I can distinguish between outright swill, of the $3.99 a bottle variety, and better wines, but my palate’s capabilities end at about the $10 a bottle mark, and from there on up I can’t really appreciate the fine nuances and subtle distinctions that effete wine drinkers claim to enjoy. Now, a recent taste test suggests I’m not alone, and that wine snobs are faking it. The taste test follows in the wake of famous blind taste tests of the 1970s, in which experts were unable to distinguish between esteemed French wines and upstarts from California — and indeed, twice selected Stag’s Leap wine over the finest wines of France. The latest blind taste test contest pitted wines from France against wines from, of all places, New Jersey. The French wines won, but only barely, against the New Jersey offerings that were 20 times less expensive. As the New Yorker article linked above demonstrates, there’s lots of evidence that the supposedly educated palates of the wine snobs really are influenced mostly by labels, and that supposed experts will describe the same wine in diametrically different ways, depending on whether a high quality label or one indicating the cheap stuff is attached. The studies all point to the conclusion that most people really can’t distinguish the high-cost vino from the $10 bottle. I think that’s right, and that’s why I don’t spend more than $15 a bottle in stores and refuse to buy the outrageously priced bottles in restaurants. Our friends the Cave-Dweller and his lovely wife soon will be taking a wine-tasting trip to the Napa Valley, to celebrate their 25th anniversary. Perhaps next year they should head to New Jersey? Last night Kish and I were watching TV and saw the preview for the next Adam Sandler movie, That’s My Boy. The preview made the movie look like the worst movie in the world — which is about par for the course for Adam Sandler movie previews. They’re uniformly awful, and when the latest Adam Sandler movie is released each year, we Americans are just expected to stolidly endure them. For years Americans cackled at the French for inexplicably admiring, and indeed finding deeper significance in, the “genius” of Jerry Lewis movies. I wouldn’t be surprised if the French chuckle at the fact that Americans have a seemingly endless appetite for low-brow Adam Sandler drivel. The movies keep getting made, so somebody must go watch them. The question is: who? You wouldn’t think there would be a sufficient audience of pathetic, friendless, unmarried 40-year-old guys who appreciate the subtle humor of a pie in the face, but apparently there are. Watching the That’s My Boy preview, I found myself imagining how Adam Sandler movies come to be. Picture a man running away from you, down a long hallway. He bursts through the door of an office, and a Hollywood type wearing a Hawaiian shirt and about a pound of gold neck chains looks up. In fairness to Sandler, I haven’t been to see one of his movies since the Happy Gilmore era. For all I know, the movies are richly rewarding, profoundly moving viewing experiences. However, I take the previews at face value, and consider them to be fair warning. If I went to see That’s My Boy and it was even close to as dreadful as the preview suggests, I’d have no one to blame but myself.